The lucky chair item at Mystic Sky currently is this peach gown. Comes with two capes, one green and one peach, both with scripted hoods. Outfit: "Annabell in Peach" lucky chair at Mystic Sky. Skin: "DARIA Skin gift" on the table in the skin store at Beauty Avatar. 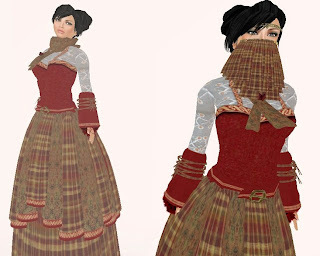 Mystic Sky is also participating in the Pilgrim Hunt which only last until Nov 30 so look for the pilgrim hat while you are there to find this gown. Outfit: "Serendipity Gown Emerald" Pilgrim Hunt prize at Mystic Sky. Silent Sparrow has put two new items in their lucky bird that could fit into a variety of roleplay themes. The female version of the outfit called Wintermoon Suite can be worn several different ways (pictured below) but there is also a male/unisex pant and jacket version called Wintermoon Suit (not shown). In order to collect your prize when your letter appears on the lucky bird you must be wearing your Silent Sparrow group tag. The Plastik lucky boards include this set of skins called Miliana Rome in several fantasy like skin tones including drow and dryad with faint tattoos or markings around the eye, wrists, chest and back. In order to collect your prize when your letter appears on the lucky boards at The Plastik you must be wearing your group tag. Outfit: “Wintermoon Suite” group lucky bird prize from Silent Sparrow. Skin: “Miliana Luna(Deco)-Rome” group lucky board prize from The Plastik. Hair Left: “Flow – White B” from the free gift (4 styles all colors) at Magika. Hair Right: “Earth - White B” from the free gift (4 styles all colors) at Magika. Arwen’s Creations has this free woman’s outfit complete with veil and modesty scarf at the main location in the Tubuk’s Ford Market next to the city gates. It is also available at many of Arwen’s Creations other gorean market stall locations. Also from Arwen’s Creations but only available at Blood Stone Island (walk to the end of the sky market and teleport down to the ship) is another free gift, this custom made outfit which includes a veil, gloves and modesty scarf. Outfit: "Blood Stone Peasant Gown " Free gift from Arwyn's Creations on the ship at Blood Stone Island. There is a new gift available in the skin shop of Beauty Avatar from the new Daria skin line. The lucky board at Solange has been updated with a new prize. Remember you must wear your Solange group tag in order to claim the prize when your letter comes up. Solange is also having a bargain basement sale - everything in basement is 5L until Friday Nov 6. The Changing of the Seasons Hunt (details on website here) inspired this look and post. Skin: “WinterStoleTheDryad'sHeart” leaf themed skin with a scar where her heart was cut out. Gift #29 from House of Ruin comes in 8 skin tones. Eyes: “Elemental: S.E. Dryad's Heart” a small leaf in the center of the eye. Gift #29 from House of Ruin. Wings: “Wood Nymph Wings Winter” gift #30 from Urban Dare also includes fall nymph wings that are not snow covered. Outfit: “Mira Nikos” is the new Midnight Mania prize from Feral Designs. Although traditionally marketed for Gorean panther girls, perhaps a dryad or nymph could use the warmth of furs with the coming snow. For those of you whose character might have a tattoo.